It started with a simple idea — a desire to help undernourished public school children — and marketmanila.com readers have responded with such incredible warmth and generosity. From that little spark of an idea some 3 years ago, the marketmanila.com feeding program has raised in excess of PHP1.5 million and provided some 75,000+ FULL meals (the actual number is more, as beneficiary schools often feed more than planned for the budget given) for public school elementary kids in Taguig and Cebu. It has been a SUSTAINED program for the past 3 years, with roughly 250 students participating in 3x a week lunch or breakfast meals for the entire school year. Our biggest single donor has been the restaurant Mamou, and we gratefully acknowledge their generous support over the years. As promised, the photos here are of a special market basket that Marketman will be giving away for FREE to someone who eats at Mamou on Wednesday, 21 July 2010. Not only will the proceeds of your meal be donated to the public school feeding program, but you have a good chance (say 1 out of 50 tables or so) of winning this wonderful basket. 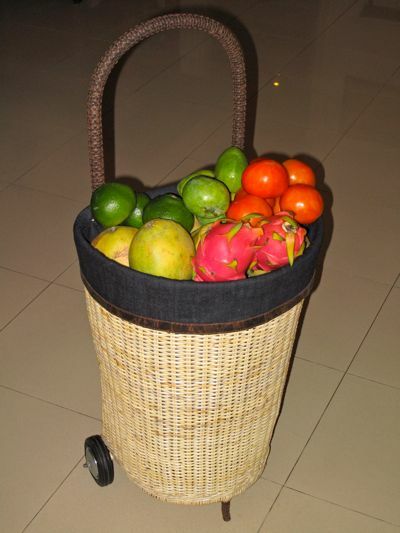 Philippine made, the strong rattan basket sits on wheels and the handle is covered in woven leather. It has a denim liner that can be removed to be washed. Similar baskets in the West would run you some $200-$300. And Marketman will throw in a 1-hour personally guided market tour (if the winner desires it) of either The Salcedo Saturday Market or the AANI FTI Taguig Market and introduce you to some of my sukis and point out various sources/vendors/etc. The guided visit to be arranged at a mutually convenient early Saturday morning. …while another reader suggested tote bags that we had made in cacha. …followed up by photos of the Cebu feeding program here. A “Thank You” from the Kids (if you only read one old post, READ this one)! The 6,000 meals Mamou donated last year. Cool beans. I am in town in time for this. Thank you MM for people like you, with a compassionate heart…. Keep it up. God Bless! Please remind us again (in case there have been changes) how those of us outside the Phils. can send our monetary donations to your wonderful feeding program. Thank you for your kindness and compassion. Congratulations to Mamou and all its employees, to all Market Manila readers and donors and to you MM and your family. Now if only we could all go and enjoy Mamou’s offering. Oh, and congratulations too, to whoever wins the baskets offered by MM. And don’t forget the personally guided tour!!! if the family was there, we would eat at Mamou too knowing too well that it is for a good cause. More power to Mamou and to you too Mr MM and family! Bless your generous heart and that of the donors! 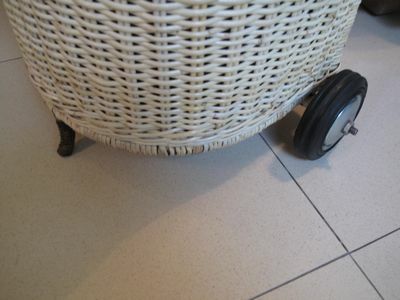 I fell in love with the basket the moment I saw it and I remember France ‘coz the locals always have this trolley basket with them when shopping!!! I would hate to see this program stop. THANK YOU MAMOU and MM for making sure this continues… HAPPY ANNIVERSARY, MAMOU! WOWOWOWOW! WOW to the feeding program, WOW to Mamou, WOW to the basket, and WOW to MM’s offer of a guided tour. So heartwarming to see such generosity all around. Just proves that one doesn’t need an NGO, or an agency/committee/association to do something for others. 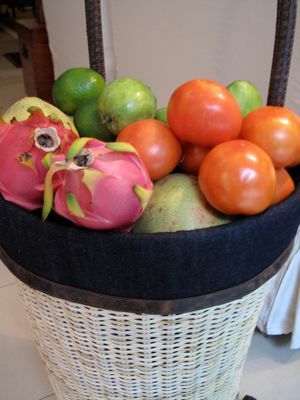 as for the basket, MM, you always manage to find the best local stuff! where is this available? Congratulations to Mamou and thank you MM for allowing us all to contribute somehow to your wonderful feeding program. Your feeding program is very inspiring. More success to you on this project! Looking forward to the pictures & posts from your guided tour of Salcedo Market with the lucky winner. What are your 10 most frequently purchased produce items? What 3 or 5 Filipino Dishes?? ?